Sheikh Fahad Al Thani made an unexpected return to the saddle on Tuesday when taking part in a barrier trial held on the beach at Surfer's Paradise on the Gold Coast. 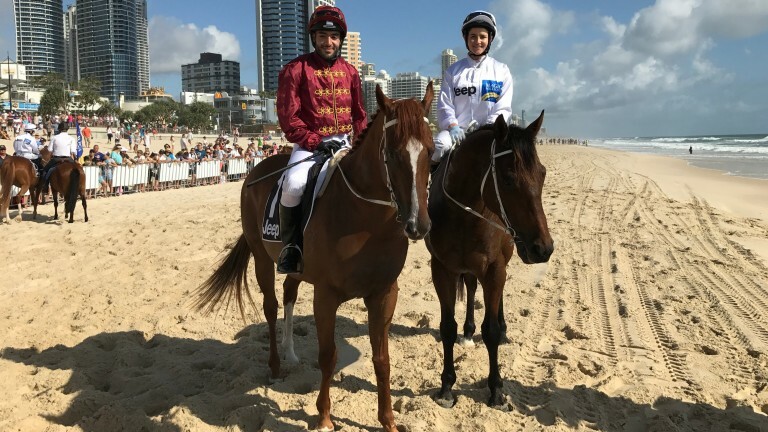 The event was staged to promote the beginning of the Magic Millions Gold Coast Yearling Sale, which starts on Wednesday, and the accompanying race day, which features over A$10 million in prize-money. While barrier trials are used to train and qualify young horses for racing in Australia, Tuesday's event was much more about entertainment than education, with a host of top southern hemisphere jockeys including Melbourne Cup winner Michelle Payne, Kathy O'Hara and Tommy Berry also taking part. "It was good fun," said Sheikh Fahad. "It's a great idea to do something like that before the sales and before the races." The event was also attended by the likes of Mike and Zara Tindall and Francesca Cumani, and later staged the draw for the Magic Millions Two-Year-Old Classic, for which the Chris Waller-trained From Within is favourite, and Magic Millions Three-Year-Old Guineas, for which Winning Rupert heads the market. The Sheikh was easily identifiable among the field as he sported his familiar maroon and gold silks. Despite his enjoyment, who booked him to ride remained a mystery to the powerful owner-turned-jockey. "I haven't got a clue," he remarked when asked how the ride came about. "I came in and they told me 'you're riding, bring your boots!'" Sheikh Fahad was last seen winning the 347th renewal of the historic Town Plate at Newmarket, where he steered Almagest to a comfortable victory. Despite his absence from public racecourses since, the Sheikh revealed he had been getting plenty of practice. "I'm riding out most days in Newmarket," he said. "With David Simcock mostly, and I was hunting on Friday with the Ledbury. We had Paul Carberry up there with us." Fahad initially travelled to the Gold Coast to attened the Magic Millions Yearling Sale, where the first yearlings by a stallion named Zoustar he has shares in are set to come under the hammer. " "I was here for the sales, to see Zoustar's stock. I might try and buy one or two of them. They look the part so hopefully they can run," he added.